I clearly recall the conversation I had with my Mom and Dad this past July about the laying of wreaths for civilian victims of war at an upcoming event on Remembrance Day. My Dad had an incisive mind and although his stroke robbed him of the majority of his speech, his receptive language soldiered on for 20 years. I picture him now sitting up in bed in their flat in London, England, at 7AM that July morning, sipping his Earl Grey tea and ‘participating’ in the discussion. His eyes were glued on mine and his brain was working hard to formulate the verbal response he knew would never come. But his lopsided smile and sparkling eyes told me he had a lot to say about the civilian victims of war. As the July sun streamed in through the windows, that morning’s Bible reading – our morning ritual – was about peace. Me, an avowed atheist. Them, strong believers. My Dad nodded and grinned as my Mom and I talked about the Sermon on the Mount. “Blessed are the peacemakers, for they shall be called the Children of God.” I told them about the upcoming event, Let Peace Be Their Memorial, which I would be singing at. It would take place 7,600 kilometres away in Vancouver on November 11. Both of my parents are survivors of the Second World War and I know it’s important for them to still bow their heads for two minutes on Remembrance Day and remember good friends in the British Navy and the Wrens who were blown up or drowned at sea. But they were intrigued by this new angle about the overlooked civilian victims of war. I shared that a group of women would lay wreaths to honour those like Anja, raped by soldiers in wars around the world. Anja was forced to bear her assailant’s child, then was shunned by her own community. My Dad was an intensely kind and moral man and I could see tears coming to his eyes. When he left the navy, he was a Commander and he could have gone into a successful career in administration, as many of his friends did. But he went into the Church, and as a lowly vicar in a small parish, he understood loss and the subsequent overwhelming grief. The rest of the day as we moved in and out of the conversation, I was amazed by how much the topic of the civilian victims of war resonated with articles I was reading to my Dad from the Times; and how it resonated with an letter from an old naval friend who was with my Dad escorting convoys to Russia over the North Sea avoiding the deadly U-boats coming out of the Norwegian ports. 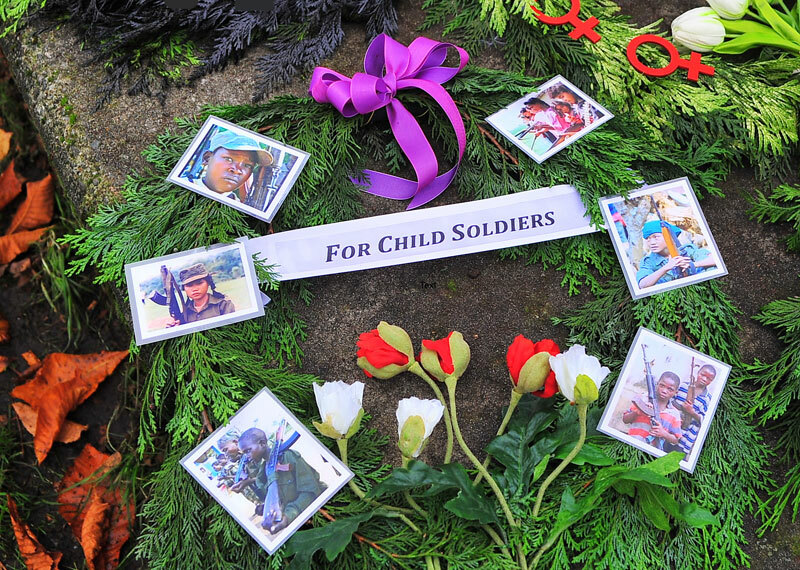 “We’ll talk about the wreaths that have been laid here in past years for so many civilians, adults and children damaged in some way or killed by war. Sachi is older now, but like many Hiroshima children, she was playing in her schoolyard when the bomb fell. She survived the blinding flash and black rain, but watched her father die a slow death from radiation poisoning. I distinctly recall the expression on my Dad’s face when I looked up. I didn’t need his approval but I had it. If my Dad’s response was anything to go by, attitudes are broadening on the focus of Remembrance Day. The message of peace is gaining acceptance in Vancouver and elsewhere. Our soldiers aren’t the only ones killed and damaged by war. I didn’t read my parents the whole article, but I did read them the ending: A poem called Ali Ismail Abbas by Daniel Amoss, winner of a U.K poetry contest for children under 12. With no arms, brown eyes. Perhaps you are moved enough by this personal story about my parents to join us at this event. Sachi, Fazineh, Tima and many others will be laying wreaths at this special ceremony. Join us at Seaforth Peace Park (Burrard @ 1st) in Vancouver.